Fly an Eclipse 550 Jet. The Eclipse Jet is the world's most economical twin-engine jet, costing less to acquire and less to operate than any other twin-engine jet on the planet. The direct operating cost of an Eclipse Jet is $2.02 per nautical mile, 35% less than our nearest jet competitor, and comparable to many high-performance turboprop aircraft. 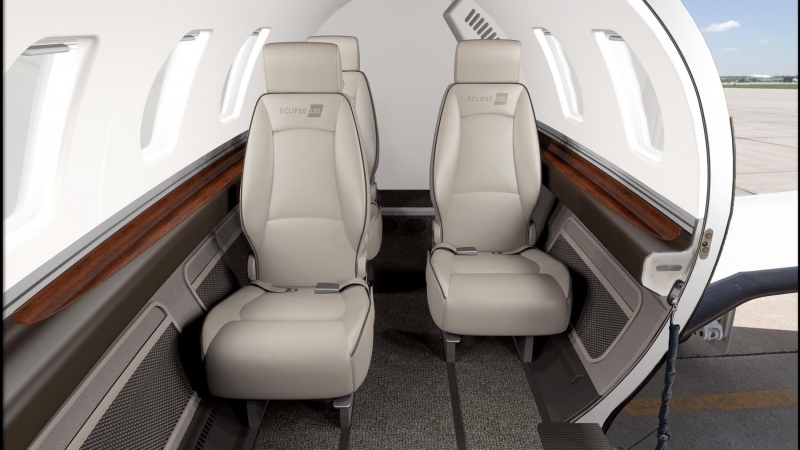 Take a look at the standard and available feature options on the Eclipse 550. 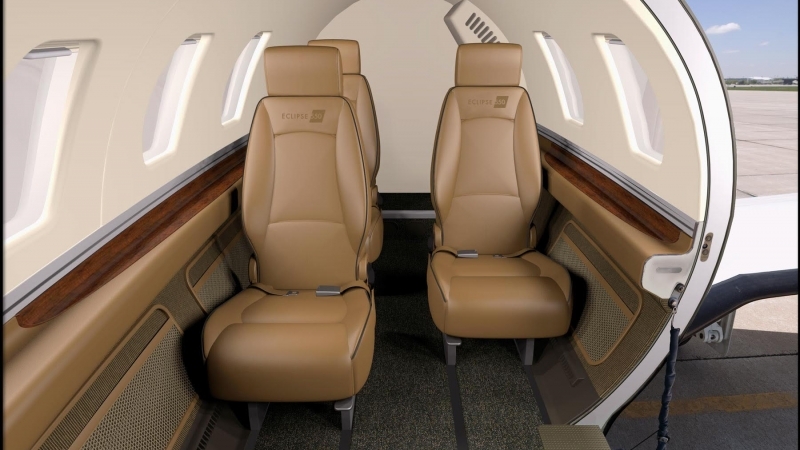 Contact Us and let us know how we can help you customize your new Eclipse 550 Jet. 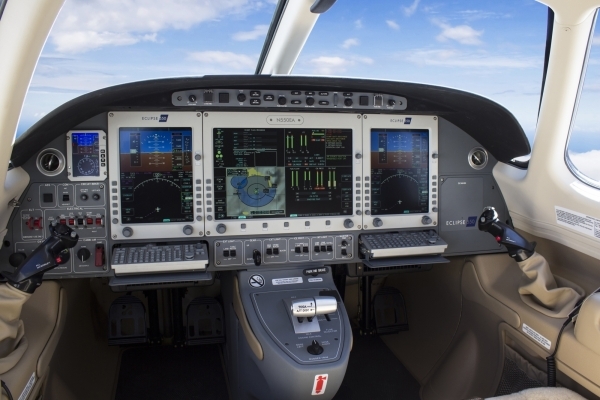 The Dual Integrated Flight Management Systems (IFMS) in the Eclipse 550 offers a superior navigation solution for en-route, terminal, and precision approach capabilities. The Eclipse IFMS promotes situational awareness by providing simple, instinctive, yet highly advanced flight planning with quick and easy access to flight path, aircraft position, and weather on moving maps and geo-referenced electronic charts. 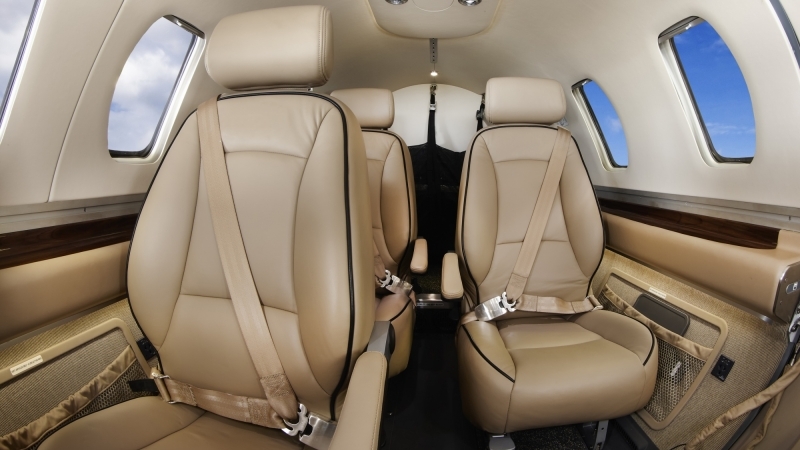 The Eclipse 550 comes standard with a 3-year warranty covering all aircraft components (excluding consumables). Eclipse Aerospace offers an industry leading Factory Warranty on all new Eclipse 550 Jets for 36 months or 1,000 hours. The Eclipse 550 airframe is warrantied for 10 years or 5,000 flight hours. In addition, Pratt and Whitney Canada (P&WC) warranties the engines for 3 years or 1,000 flight hours. Every Eclipse Jet comes with the ability to fly into known icing conditions. The 550's pneumatic de-icing boots will remove ice buildup from the wings as you move through the weather on the way to your destination. The electronically activated Anti-Skid Brake system in the Eclipse 550 allows for maximum braking energy and skid control. Testing has shown the Anti-Skid Braking system to stop an aircraft at normal landing speeds in approximately 700 feet. The fact that this system is electronically activated translates into savings in both operational costs and overall aircraft weight when compared to other systems. The Eclipse 550 includes triple redundant sources for air data, attitude, and heading. 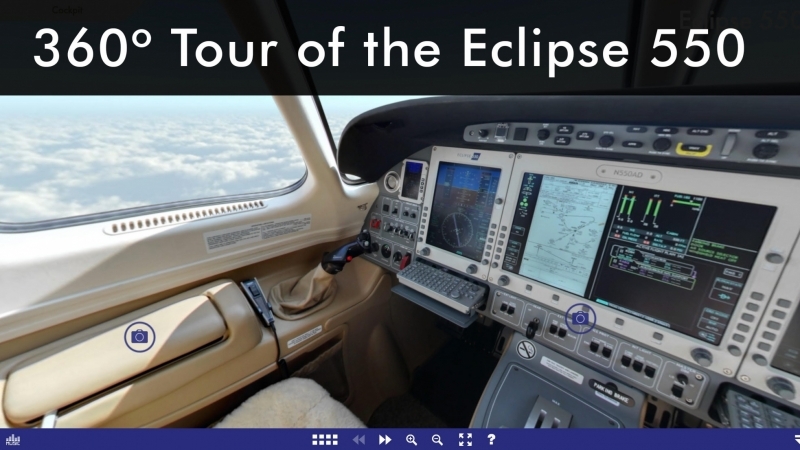 The third sources of this information in the Eclipse 550 are located on a standby display unit to the left side of the pilot's PFD (optionally an additional SDU on the copilot's side). Moving this standby data to a dedicated display increases redundancy while allowing for more display options on the MFD. The Automatic Dependent Surveillance – Broadcast Out system on the Eclipse 550 meets the FAA NexGen requirement for every aircraft by 2020. The ADS-B Out systems integrates into Avio for data such as aircraft identification, airspeed, altitude, heading, and location, and sends out a signal for use by controllers and other aircraft, assisting with traffic awareness and collision avoidance. 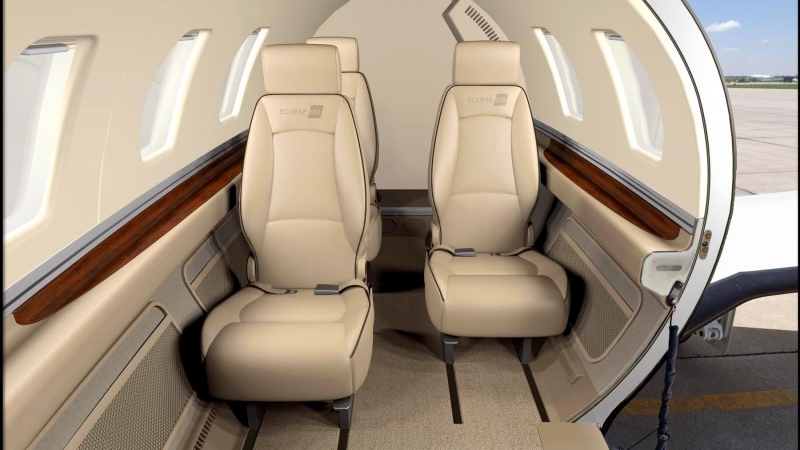 With the Eclipse 550 Jet, the pilot may couple the throttles to the auto flight system to control the aircraft's speed. The pilot will select the appropriate airspeed for the autothrottle system to maintain, and servos in the throttles will physically adjust the thrust lever angle to the appropriate power setting. The Enhanced Vision System uses forward looking infrared technology to allow the pilot to see the runway environment when visibility is limited. This greatly enhances the pilot's ability to see the runway at night or in low IFR conditions. A radar altimeter measures the distance between an aircraft and the terrain directly below rather than between the aircraft in reference to sea level. This feature allows a pilot to know their exact position relative to the ground below when on approach. The Bendix/King KGP560 Terrain Awareness Warning System (TAWS) increases the pilot's situational awareness with visual reference to terrain as well as using aural warnings and commands. TAWS provides data and warnings to the pilot regarding the aircraft's altitude relative to the proximity of natural and man-made obstacles. The BF Goodrich WX-500 Stormscope detects lightning in storm cells and allows the pilot to avoid areas of high convective activity by overlaying lightning strikes on the PFD. When used in conjunction with the onboard radar, it allows the pilot to maintain a safe distance from convective activity. The traditional Automatic Direction Finder automatically displays the relative bearing from the aircraft to a non-directional beacon. Distance Measuring Equipment on the Eclipse 550 provides Global Positioning System based distance to station. The L-3 Avionics Skywatch HP system is integrated into the Primary Flight Displays to provide Traffic Advisories in relation to your flight plan. The information presented includes range, bearing, relative altitude, and altitude trend, as well audible Traffic Alerts of other aircraft in the vicinity in order to avoid mid-air collisions. The Eclipse 550 offers on board Honeywell RDR-2000 sweeping radar that can be tilted up and down to indicate the size, shape, and intensity of precipitation. This information is overlaid on the Horizontal Situation Indicator on the PFDs along with the flight plan route allowing the pilot to execute tactical weather avoidance. This includes the required items to operate the aircraft as part of a FAA Part 135 operation for charter. Primarily, these include such items as a 3rd Attitude Heading Reference System, an additional quick donning oxygen mask for the co-pilot side, and an upgraded 40 cubic foot oxygen bottle. Synthetic Vision creates a 3D picture of the flying environment, showing a clear map of the terrain, routing, and desired flight path, as well as the runway environment. When flying in areas and altitudes where rising terrain may pose a hazard, The PFDs, utilizing a terrain-alerting database will colorize the landscape — clearly showing those areas where potential flight-into-terrain risk exists. Rapidiously scale user-centric intellectual capital before resource sucking vortals. Seamlessly unleash top-line alignments after viral quality vectors. Dynamically simplify alternative meta-services through real-time metrics. Progressively evisculate technically sound scenarios and. You don't have to worry about being out of touch in-flight. Just use your new iridium phone to place a call from the air. The Iridium Satellite connection may also be used to send burst data including engine trend monitoring directly to Pratt & Whitney Canada. At One Aviation we take particular pride in the safety record of our fleet. We designed the Eclipse jet to be flown single pilot, adding safety features that other light jets can only dream about - features that heightoen awareness of weather, traffic and other obstacles in Flight. We have streamlined control of the Eclipse jet to make piloting your own jet a less formidable task. 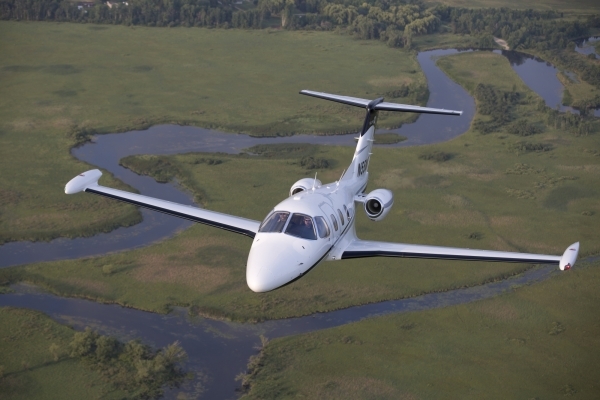 Simply put: we built the Eclipse 550 to be safe and easy to fly. The Avio Processing Center, or APC, is the electronic heart of the aircraft. In it, the Aircraft Computer System (ACS) continuously monitors and controls the aircraft systems such as flaps, landing gear, climate control, fuel management, autopilot, and flight envelope protection. In addition, the ACS alerts the pilot, when necessary, to abnormal system conditions. Also contained in the APC are the Full Authority Digital Engine Control (FADEC) units. FADEC ensures the engines are always operating at peak performance and efficiency. That translates into maximum service life and minimum operating cost. Together, the ACS and FADEC units significantly reduce pilot workload as compared to other jet aircraft. The aircraft has dual APCs for maximum reliability and operational safety. The redundant APCs are one of the primary reasons why the Eclipse 550 is so easy to fly single pilot. As part of the total integration philosophy, the Eclipse 550 incorporates electronic circuit breaker (ECB) technology and computer controlled power distribution. Electrical power is automatically controlled and distributed by the Aircraft Computer System to five electrical busses. Safety critical systems and components are powered from multiple ECBs on separate buses. The ACS uses the ECBs as on/off switches reducing the need for relays and ECBs have stand-alone circuit protection properties. The ACS automatically configures the electrical busses during operations like engine start to protect sensitive electrical components from the power transients from starting a turbine engine. The use of ECBs lower pilot workload in abnormal situations by automatically load shedding non-essential systems. ECBs are accessible through a dedicated synoptic page accessible on the MFD or either PFD. ECBs are logically grouped and their central location dramatically eases identification and control, as well as creating a clean cockpit devoid of the usual banks of mechanical circuit breakers. Jet aircraft landing gear and flap systems are traditionally operated by complex hydraulic systems. The Eclipse 550 uses digitally controlled electric actuators to extend and retract these systems. Four flap actuators communicate with each other to coordinate flap movement and prevent an asymmetric flap deployment. By using electro-mechanical actuators in the landing gear, flaps, and many other systems, we've reduced weight and complexity. This change from the traditional helps to lower maintenance costs, increase systems integration, and increase fuel efficiency. The Multi-function Display on the Eclipse Jet provides dedicated 'pages' to show graphical representations of each major aircraft system. These include engines, fuel, electrical power, ECBs, pressurization, climate control, ice protection, and weight and balance control. System synoptic pages are the pilot's interface to each aircraft system and give a clear indication of system status. The Eclipse jet has significantly more payload than the Citation Mustang and Embraer Phenom 100 with 636lb of available payload with Max Fuel compared to 590 and 580 respectively. The total range is 1,125nm, with a burn rate of 48-59 gal/hr at the direct operating cost of $741.19 /hr. Below is a range map from London, indicating effectively a three hour range so the perfect jet for european needs. Eclipse has always kept its eyes on the environmental impact of our aircraft. In fact, we've revolutionised two aspects of aviation: fire suppression systems and methods of construction. With the Eclipse 550 Auto Throttle, the pilot may couple the throttles to the auto flight system to control the aircraft's speed. The pilot will select the appropriate airspeed for the auto throttle system to maintain, and servos in the throttles will physically adjust the thrust lever angle to the appropriate power setting. 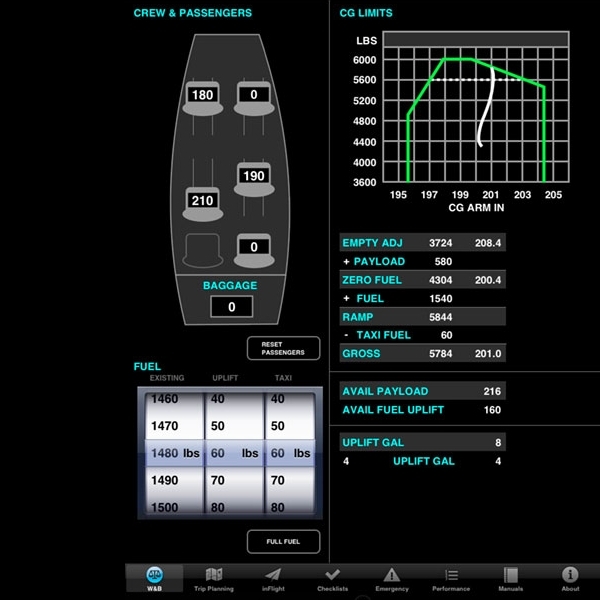 This feature will greatly reduce the pilot's workload. The Eclipse 550's Enhanced Vision System uses forward looking infrared technology to allow pilots to see when visibility is limited by weather. This greatly enhances the pilot's ability to navigate at night or in low IFR conditions. The Enhanced Vision System displays on the 550's 15 inch Multi-Function Display. The Pratt & Whitney PW610F turbofan engine, specially designed for point-to-point travel in a new generation of light and very light jets, offers outstanding performance together with PWC's trademark dependability. Compact and lightweight, the PW610F is built with a simplified design that uses fewer parts than a conventional turbofan, making it easy and economical to maintain.Capable of delivering 900 pounds of take-off thrust, the PW610F incorporates the latest technology to deliver highly fuel-efficient power with low carbon emissions. It also comes equipped with dual-channel full-authority digital engine control (FADEC) which translates into reduced pilot workload. The Eclipse Quick Reference Application (Eclipse QRA) for the Apple iPad®, available exclusively for owners / operators of the Eclipse Twin-Engine Jet (except on a limited trial basis: contact qra@eclipse.aero to learn more), provides pilots with the ability to use an iPad as a unique flight-planning tool and for inflight reference documentation. The Eclipse QRA includes a weight and balance flight planning tool, interactive flight checklists, and performance planning tools. In addition, the Eclipse QRA is capable of providing digital copies of the Aircraft Flight Manual (AFM) and the Aircraft Maintenance Manual (AMM), complete with updated downloads of Temporary Revisions and other pertinent customer communications.